I usually use a different brand and bought this since it was on sale at costco. I was surprised with how good the quality was and how clean it got our dishes in the dishwasher! I'll definitely purchase again! I use this item regularly. What really got me hooked, beside the convenience, is how well they clean. I rarely rinse dishes, and they come out clean each time. 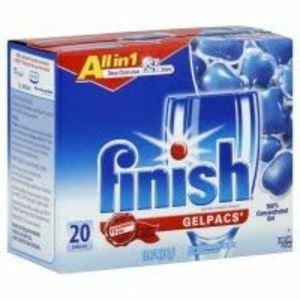 Finish Gelpacs leave my dishes sparkling! I've been using Finish (formerly called Electrasol) for over a decade, and it has always done a great job on my dishes. Back when I was in my college apartment, a new roommate commented on the fact that we were using Finish pacs. "I thought you were buying these because you were lazy," she said, referring to the fact that there's no measuring necessary. "But now I see that they work really well." Her comments sum up my Finish experience exactly. My favorite Finish product is these gelpacs. They are cute little plastic pillows filled with blue gel. They always dissolve completely. 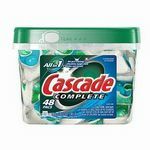 I've used them in several brands of dishwashers, ranging from new and good to old and cruddy, and the Finish gelpacs always get my dishes sparkling clean. I've never had any problems with streaking or clouding; my glassware comes out lovely and clear. I almost never have any stuck-on food residue left; Finish does a great job of cleaning even the dirtiest pots and pans. I buy Finish gelpacs in the orange scent, and I like the way it makes my house smell. The packaging emphasizes the need to close the bag of gelpacs carefully, so that they do not dry out. I make sure to fold the top of the bag over, and I have never had any problems with the packets being dry. Overall, I highly recommend Finish gelpacs. This is my favorite dishwasher detergent to use! In fact, I won't use any other! 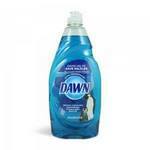 This cleans my dishes so well and it doesn't leave any film behind. I've used the Finish powder before, but it leaves behind some of the soap on my dishes. The gelpacs do not! And you can't beat the price, it is cheaper then some other brands, but I believe this does a better job. 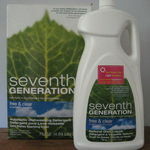 Since the phosphate ban, I've been wanting an effective dishwasher detergent. After changing brands several times, I decided that I'd just have to live with cloudy glasses. After two months of using Finish Gelpacs, my drinking glasses look clean again and my silverware is shiny. I started using Finish Gelpacs because I'm chemically sensitive and react to the dust of the powders and the perfumes in the liquids when I pour them into the soap dispenser. I really like the Gelpacs because I can take a gelpac straight from the box, put it in the dispenser and not come in contact with any chemicals. Having cleaner dishes is an added bonus. It really does work and no more spilled detergent. The best thing to happen to a dishwasher since...the dishwasher. The most wonderful thing to happen to a dishwasher since...the dishwasher. Yes, you could say that I like this product just a little bit. I love these little blue beauties. My dishes not only look clean but they feel and smell clean as well. I love that I do not have to mess with bottles and boxes with those lovely and I am being sarcastic here pour spouts that are so easy to use and designed for neatness as well. I have never been a fan of the pour spout from a box no matter what it is but it always happens that those hard little rocks that they call detergent end up all over. They are not good for your dogs or your young children. Now you have a safe, clean, and easy as well as cost effective method. I do not have to re-wash dishes any more or rinse them so this product is most likely saving me money and time that I don't have a way to figure in. I know what I like. I love clean, safe, saving money and time so that I can spend it with the ones I love. This product is an A++ in all of those areas and more. Finish Quantum Gelpacs lived up to their ads! I used the Finish Quantum Gelpacs for the first time because I had a coupon for them. I've always been satisfied with the other brand I use, but not particularly awed by any that I've tried. We live in an area where there is particularly hard water, and the dishes often have a residue on them. To solve this we generally just add vinegar to the dishwasher every time we run it, but with the old brand the dishes still came out with the occasional film/buildup. With Finish Quantum we have not had that problem- the dishes come out SHINY and CLEAR! I am impressed by the performance, and I think they are a totally reasonable value for their price, especially with coupons. Electrasol Powerball Tabls 3 in 1 tabs go into your dishwasing machine. They come individually wrapped in a box of 20. To use you simply remove one from its personal packaging you then just place it ball side up in the soap dispenser part of your dishwasher, and wash dishes as usual. The Electrasol tabs are about 2 inches long by one in wide, and about ¾ of an inch in height. It looks like sort of a rounded edge rectangle of compacted dish washing detergent powder. In the center of the little compacted rectangle is a little pink ball that is embedded inside of the compacted powder. What looks like compacted powdered dishwashing detergent is actually 2 levels. One of the layers the blue layer is a powerful cleanser, the other layer is a Jet-Dry rinse agent. The agent helps rinse away residue, and eliminates spots and allows shine to come through. The little pink ball is called the power ball. The powerball helps to soften food residue so that it comes off of the dishes more easily. It helps to dissolve he dried on food. The Electrasol power tab is nice and easy to use. You not have measure anything, you don't have to worry about spilling it or over filling the cup. You just simply place it in the detergent cup close it up and let it do its thing. One advantage it has over the Cascade 2 in 1 is that you don't have to worry about puncturing it, or about that it will be ruined if you accidently get it wet. When it is in the dishwasher the tab completely resolves and is all gone when you are finished so there are no worries. There is of course a warning on the box that this should not be eaten, if it does get eaten the mouth should be washed out, and a glass of water should be drunk, and a physician or poison control should be called. If you happen to get some of this in your eye remove contact lenses and rinse the eye continuing for 15 minutes. As far as how they work, they work better than regular powders, the definitely work better than liquid dishwashing detergent, and the equally as effective as the Cascade 2 - 1. I have had a couple of pads that did not completely dissolve for some reason and that load failed to get completely clean, but I have also had that happen to me with the Cascade 2 - 1, but for the most part and for the majority of the time these work really well. Seldom is there left over food when I use this, although sometimes there is but I have never found anything that is perfect when it comes to my dishwasher so I would say it is about 92% effective. While I would say a normal powder would only be about 80% effective and for a liquid dishwashing detergent I would go even lower on the effective percentage. My main complaint is petty, they are individually wrapped which is a good thing as they won't get all wet if water happens to get on what ever you decide to keep them in, but the wrapping is kind of hard to get off. We eat dinner pretty late and I am usually tired. I just want to get the dishes put in the dishwasher and get it going, I don't want to have take 2 mintues to pull the wrapping off or find a pair of scissors to cut it off. Like I said it is a minor complaint. I do like how these tabes work. I think they are nicely priced. They don't clean perfectly but I have yet to find anything that does, but it cleans pretty good. **Finish All in 1 Gelpacs** do clean well. I can't deny that. I use only one in my aging dishwasher, and the dishes come out (mostly) sparkling clean. However, there is a major problem I've experienced with my first and only box of **Finish All in 1 Gelpacs. **I used about 1/3 of the box, which I kept under my kitchen sink. Then I reached in for one and came up with several. Somehow, over the month or two that the box had been in my kitchen, two-thirds of the gelpacs had become glued together. I emptied the box and tried to gently pull the gelpacs apart. There were two or three stuck together in various blobs, and even with the gentlest pull, they were firmly stuck. I managed to get a few apart, but others burst when I pulled them away from each other. I'm not sure what design flaw led to this stickiness, but I am going to write to Finish to complain. I won't be buying gelpacs again. As for cleaning, my most recent load had three butter knives that came out almost as dirty as they went in, with food residue still on the upturned ends. In fact, at least one was on its second trip through the dishwasher. I had to clean those knives by hand. Otherwise, Finish All in 1 Gelpacs seem to do a fine job of cleaning. But because of the sticking problem, I can't recommend them. I am always looking for a bargain and am willing to try almost any product if the price is right. When it comes to dishwasher detergent I have used a lot of brands and most of them are ok with fairly decent results but some just do not work well for us. 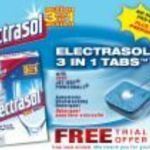 I purchased the Elecrasol 3 in 1 tablets when they were on a good sale and decided to try them. 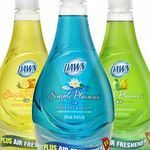 I usually use a gel or powder diswasher detergent but these seem convenient and worth a try. I ran the first load with dishes with a little bit of mess on them just as a simple test to see how it would work on the light load. I wasn't impressed. The bowls still had cereal on them when the cycle was done. There were water spots on most of the dishes. After a little looking around I found almost three quarters of the tablet in the bottom of the dishwasher. We have well water and it is a bit on the hard side so I think that may be the issue. This seems like a good product and very convenient but will not necessarily work with your water type.